'Scholars Week': Listen to Mar..
Music colloquium draws 2 top s..
Blackman Collegiate Academy juniors sampled science at MTSU and the University Honors College during a March 24 visit to campus. Geosciences, biology, physics and astronomy, Concrete Industry Management and the university’s Experimental Vehicles Program were areas the Blackman High School students discovered in the school’s second visit to MTSU this year. The MTSU-Blackman partnership is one of several arranged each semester during the academic year. It allows freshmen, sophomores, juniors and seniors opportunities to spend time on the college campus, meeting MTSU students, faculty and administrators and learning about many of the university’s 140-plus programs. As part of the partnership, which is designed to give them a competitive edge as they prepare for college, juniors and seniors in the academy who meet eligibility standards can take up to six hours of university courses taught by MTSU instructors at Blackman at no cost. The credits will count on high school and college transcripts. Diamond Bradley, 17, was one of nearly 10 students taking in a 45-minute session on concrete. They even made concrete coasters. Classmate Gabrielle Brown, 16, liked the fact “a lot of job opportunities” can be found in the concrete industry. 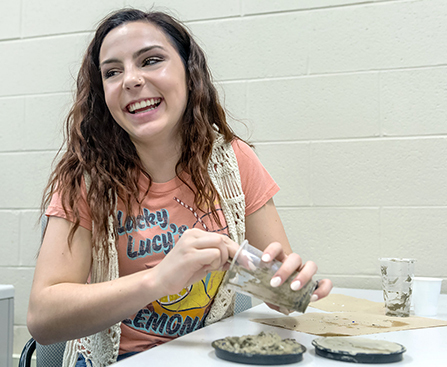 Blackman High School junior Gabriele Brown makes a concrete coaster during a session led by Concrete Industry Management’s Nicole Green as part of the March 24 Blackman Collegiate Academy Day at MTSU. Zach Rachidi, 16, was with a group in Wiser-Patten Science Hall witnessing “cool” things happening in physics, led by Department of Physics and Astronomy chair Ron Henderson. “Actually it was pretty cool and entertaining (demonstrations by Henderson), but it is not something I want to do,” said Rachidi, who expressed a strong interest in being a pilot and following an aerospace path. Dean John Vile and event coordinator Susan Lyons provided a complete rundown of Honors College options and requirements as they toured the Paul W. Martin Sr. Honors Building. Concluding their visit, Blackman students heard about “a typical day in the life of a college student” from MTSU Student Ambassadors in the Student Union Building. After arriving on campus earlier in the day at the Student Services and Admissions Center/MT One Stop, Blackman students received True Blue Bags and heard about the admissions process from Linda Olsen, director of undergraduate recruitment, and recruiter Joey Clark. MTSU Department of Physics and Astronomy chair Ron Henderson explains and then shows Blackman Collegiate Academy students how various heat and water processes create steam and eventually cause the sides of aluminum can to cave in March 24 at MTSU.